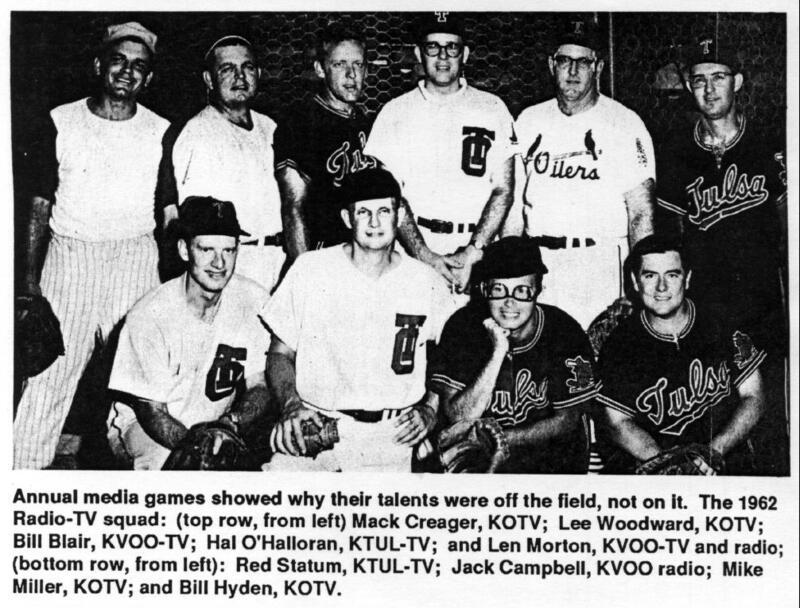 When I was at KAKC in 1951-52, I was engineer/sound man for Mack when we recreated the out-of-town Tulsa Oiler baseball games. Mack would sit in a studio, look at the very cryptic info coming over the Western Union ticker, and would make up everything else. For a base hit he would strike the table with a pencil to simulate a baseball bat hitting the ball. I kept a large turntable with two arms going at all times to provide continuous background crowd noise. I had two cuts on an electrical transmission (ET)---I think this was the correct term for the huge records. One cut had a sudden burst of crowd noise, while the other had a slow build-up to a large roar. Mack would hold up one finger for the former and two for the latter. I would cue up the correct sound, then would play it when Mack cued me as he described the play. One night the ticker tape machine malfunctioned. Poor Mack had to delay for several minutes until the signal came in again. He did some imaginative ad-libbing. He also read a couple of extra Barnes-Manley laundry commercials. I was delighted when, four years later, I was again working at the same station as Mack---KRMG. However, the days of fake audio were over. The Oiler games were not broadcast over KRMG. The story about network patching for coast-to-coast (a term never used now) switching reminded me about the patch cord problems at KAKC in 1951-52. KAKC was very primitive, even by contemporary standards. The large patch board was some distance behind the announcer, who ran the board in combo fashion in a room without any kind of soundproofing. Additionally, the patch board was unreliable. Insert a cord, and the patch might work. Do it again, and it wouldnt. One evening I made a patch to bring in Mack Creager in from Texas League Park, something I done several times before. I had Macks position on the board in the preview position, so that I could hear him call me when he wanted to let me know he was there, and that he was ready to go on the air. I rushed to the patch panel. Everything was perfect. I reinserted all the cords, and leaped back to the board. .NOW. I flipped the switch putting Mack on the air. Back to the patch board. This time in a panic. The dead air was deafening. Macks voice was becoming more shrill. Mack immediately started his sportscast. I was as amazed as I was grateful. I asked Raymond what he did that was different from what I had done. He just smiled and left the control room. Here are 1955 and 1962 Oiler Park Radio-TV Night photos with Mack, courtesy of Bill Hyden. 2nd row: Tony George, ? , Perry Ward, ? , John Turner, Ed Neibling. 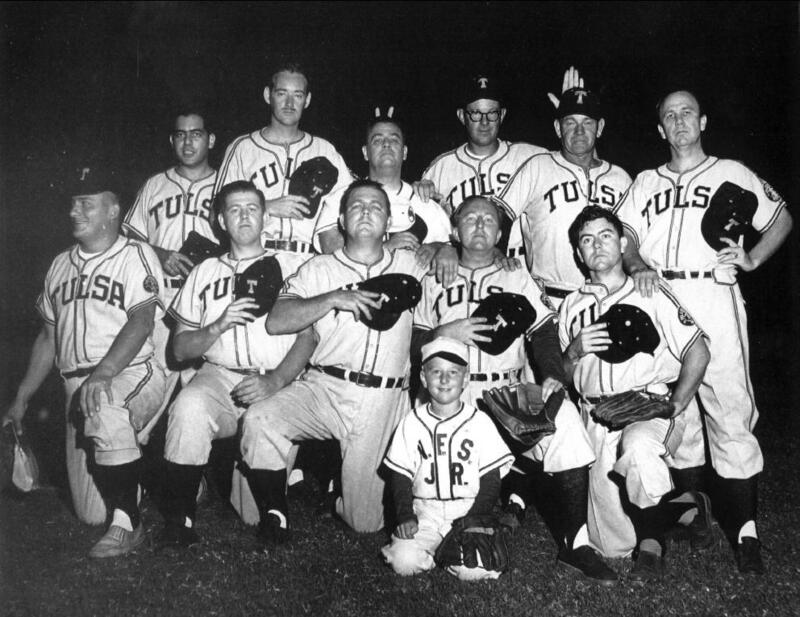 Read about Tulsa Oilers baseball on the Oiler Park page. 5/10/2005: The true story of the Creager Finger Incident. Mack is a wonderful guy and we had a lot of fun together like the time we drove mopeds through the new Channel 6, $20,000 blue screen cyclorama! At least that's what they told us it cost. Some advertiser had left the mopeds there for a spot, so Mack and I saw the opportunity and couldn't resist! Watching the Sooners beat Nebraska today reminded me of the good old days when I spent many Saturdays during the late 1960s filming the team with KOTV Sports Director Mack Creager. We would return to the station from Norman shortly before air time (for the early news) and a major problem was to trying to quickly edit about 800 feet of film. Since Mack was an excellent play-by-play announcer, I suggested he record his narration as I filmed the game. (We shot all third downs and key situations and got lucky a few times.) That way, during the editing process, I could find the highlights by listening to his audio track. This was much faster than squinting into the small viewer. We then used Macks filmed play-by-play during sports. The live on film method of football coverage sometimes allowed KOTV to beat the other channels on the early newscasts. It also freed Mack to devote more time to other duties prior to his sports segment. 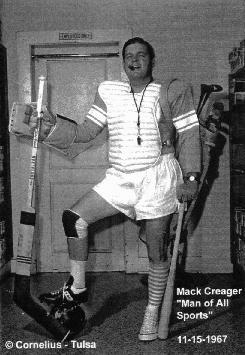 Mack Creager was not only creative and versatile, but also a lot of fun to work with, on and off the air. As Mack would say: "The cream always rises to the top." All who worked with Mack will miss him. 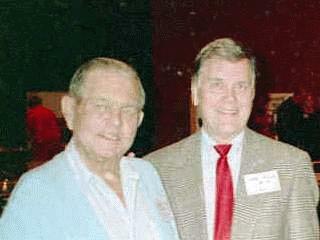 I got to meet Mack and his wife, Marge, at the KOTV 50th anniversary reunion in November, 1999. He was friendly, but moving carefully, not unusual for a man 80 years of age. Bill Hyden had invited me to show this web site to the group. It was projected on a 10' screen. I saw Mack look up, surprised to see this photograph of himself with cigar at a jaunty angle. I hope he realized that Tulsans remember him well and with affection. According to KOTV's obituary on the evening news, Marge Creager said that Mack died peacefully in his sleep. Baron "Mack" Creager, retired Tulsa television and radio sports announcer, died Friday. He was 81. Creager graduated from Central High School, where he earned All-State football honors in both 1937 and 1938. He went on to win varsity football, golf and baseball letters at Oklahoma State University (then Oklahoma A & M), playing in both the Cotton and Sugar bowls. 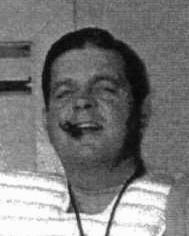 Creager took his first job in 1948 at radio station KAKC. He worked in the 1950s as a sportswriter for the Tulsa Tribune. 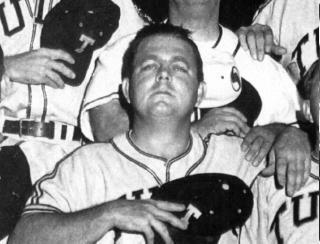 In 1948, Creager was the play-by-play announcer for all Tulsa Oiler baseball games. He broadcast play-by-play accounts of local high school football games and also announced hockey games. Creager was acknowledged as the "Voice of the Oilers" and is still remembered for his old signoff: "I'm rounding third and headin' home. Good night, everybody." In 1965, Creager became the general manager of the Texas League and in 1966 he was general manager for the Oilers. Creager made the transition from radio to television with ease. In fact, after part-time work with KOTV in the early 1950s, Creager became a regular at Channel 6, eventually serving as sports director. 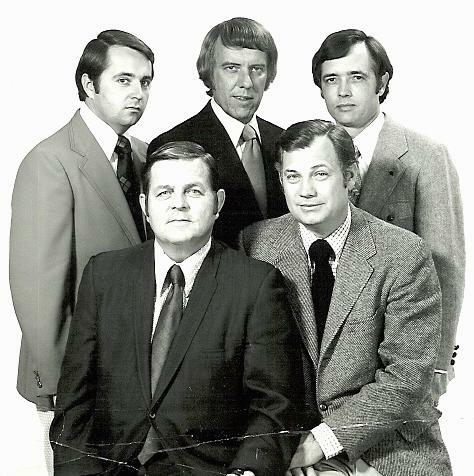 Creager retired from KOTV in 1975. He joined Bank of Oklahoma-Mercantile Center as a public relations and marketing director, retiring in 1986. He is survived by his wife, Marge Creager of Tulsa; four children, Connie Jo Duvall of Broken Arrow, Carol Annelle (Creager) Hoover of Tulsa, Larry Mack Creager of Tulsa, and Robert Charles Creager of Tulsa; eight grandchildren; and two great- grandchildren. Memorial donations can be made to the Asbury Building Fund, American Red Cross in Tulsa and Oklahoma State University Athletics Scholarships in Stillwater. "Mack" Creager's funeral was a bit unusual. After the customary religious prayers and hymns, the obituary/eulogy period followed with speakers including Len Morton, a former sportcasting colleague. Then the vocalist, Jerry Dillon, sang "There, I've Said It Again," a romantic ballad apparently significant to Mack and Marge. Then, at the end of the service, the audience (the church was satisfactorily packed) was asked to rise and sing, "Take Me Out to the Ballgame". We should all be so well sent off!